The Psychic Center of Sedona is located in scenic Sedona Arizona, named "the most beautiful place in America" by USA Weekend's Annual Travel Report. Along with the towering red rock formations, Sedona is internationally known as a spiritual mecca and for its spiritually uplifting vortex meditation sites. The Psychic Center of Sedona is located on Highway 179, the only road in Arizona designated a scenic byway by the National Scenic Byway Program. The Red Rock Scenic Byway winds through Sedona's Red Rock Country, often called a "museum without walls." Travelers are amazed by the high desert's power, diversity, and sense of intimacy with nature. Inhabited for thousands of years, the stunning red rocks are alive with a timeless spirit that captivates and inspires. A vortex is a site where the energy of an area is concentrated. Because Sedona as a whole is known to be a spiritual power spot, a vortex site in Sedona is a place where one can feel Sedona’s spiritual energy most strongly. Page Bryant, a medium, came up with the term while investigating sacred locations in the area. Airport Mesa. Closest to the Uptown area of Sedona, it offers panoramic views. Bell Rock. Adjoining the Village of Oak Creek, it has an easily identifiable bell- shape formation. Boynton Canyon. Still a site for annual Native American ceremonies, this vortex is off Dry Creek Road in West Sedona and offers the longest hike of the four main vortex sites—up to three hours round trip. Cathedral Rock. Located on Lower Red Rock Loop Road, it is the most photographed site in Sedona. The cathedral-like structure rises above Oak Creek. 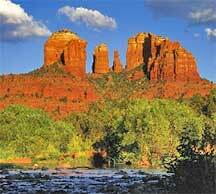 These four areas just a fraction of the energy sources and sites that you can tap in Sedona. Other special places to connect with the sacred energy of Sedona include The Chapel of the Holy Cross, Schnebly Hill, West Fork and the Amitabha Stupa. Many tourists relate Sedona's exceptional charm to the fact that visitors conveniently can spend a day hiking, horseback riding, or bouncing in a Jeep on trails and dirt roads that crisscross this area, and then enjoy the comfort of deluxe hotels, country inns and prestigious resorts at night. Indeed, this is the paradox and enchantment of Sedona: luxurious resorts and bed and breakfasts, unique shops, impressive art galleries and fine restaurants nestled in an unusually rugged canyon surrounded by an expansive national forest.